Green Crack was a clone only strain until Cali Connection got a hold of the Original Clone and spent 2 years getting her to seed. Green Crack does very well indoors in both hydroponic and soil mediums, but if you want to really bring out the taste its best to grow in soil. This strain is suitable for both beginner and expert growers. Green Crack is a excellent candidate for the Sea Of Green (SOG) method. If you plan to clone it you shouldn't have much problems as it clones easily. 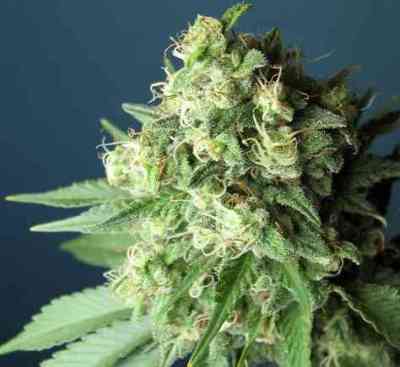 Green Crack grows somewhat tall because of its sativa genetics. Unlike many other sativas this strain finishes flowering pretty quick. If your growing outdoors you can harvest this plant before the first frost in October or after approximately 45 days of flowering. You can expect good yields of high quality marijuana with tight looking buds. With its strong sativa traits this makes a excellent daytime smoke. It has a tangy, fruity smell and the taste is sweet as well. Expect a uplifting energetic head high when smoking Green Crack. If you want to be able to be really high and still be productive this strain is for you. Not a strain you want to smoke before going to bed.